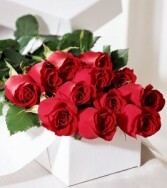 The "DOZEN PLUS" idea is that we can take a dozen red roses and arrange them in a fresh new way! 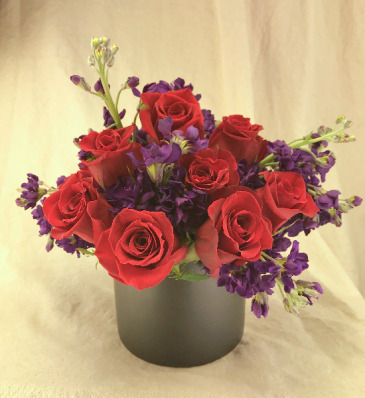 In the arrangement above we have added simply purple stock for a deep, saturated and lush presentation. This is placed in a clear glass vase that is lined with a leaf, we can't get more of the matte black vases. The "DOZEN PLUS" idea is that we can take a dozen red roses and arrange them in a fresh new way! 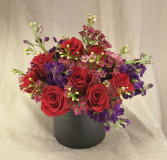 In the arrangement above we have added fresh pink wax flower and purple stock for a rich and lush presentation. This is placed in a clear glass vase that is lined with a leaf, we can't get more of the matte black vases. Our lovely "Cherry Brandy" orange roses simply paired with ruscus greenery and naturally presented in brown kraft paper tied with raffia! How nice is that? As shown and the better value at only $4 per rose is two dozen. Not shown is 1 dozen. Don't worry! We pack these for delivery by placing the freshly cut stems in a brick of Oasis floral foam inside a plastic bag. That is then dropped into a brown kraft plant sleeve for protection during transit. 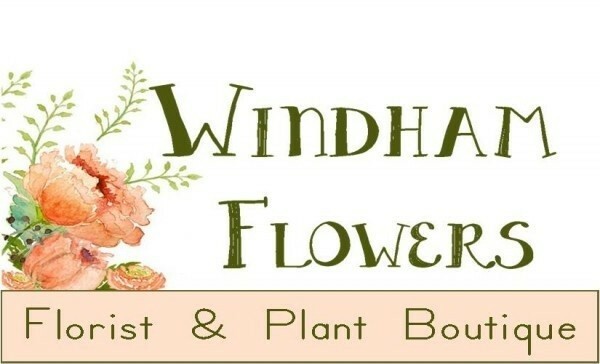 Complete instructions included along with flower food if appropriate.